Mughal history is often taken up in contemporary India, or larger South Asia, to absolve the present of its responsibility for some bitter, hard-to-digest political realities, by taking recourse to a past either glorious or disgraceful. Post Dadri lynching, it was debated all around how a bedridden Babur advised his son Humayun to respect Hindus by prohibiting cow slaughter. A sharp contrast was made with the Vedic times, when cows were slaughtered for sacrifices as well as for food. But not all aspects of Mughal era went down in modern accounts without opprobrium. We hear about jizya, Awrangazeb, and aggressive mercurial wars to which the myopically Islamophobic eyes trace the current communal tensions back to. The reason why it is proposed that a particular moment in the past should not be held accountable for the present is that the preconceptions in the present would restrict, to the worse extent possible, the objectivity of explorations. In other words, the realpolitik behind Babur’s directive to Humayun-that is, the respect for Hindus regarding ban on cow slaughter is different now, as the term Hindu can’t be applied in a wholesale manner to a community other than Muslims and Christians. Also, the reliance of Dalit economy on beef and the overarching aim of tolerating varied food habits in a multi-cultural society are factors more overwhelming than the factor Babar laid stress on. Also, motives and attitudes that the Mughals had in their relationship with other communities were different from the ones that even the fiercely militant kharijite has. In Sajida Sultana Alvi’s Perspectives on Mughal India: Rulers, Historians, Ulama and Sufis, the problem of an atavistic return to the past for adopting and justifying the politics of the present has been neatly explained: “The Mughal period has attracted disproportionately more scholarly attention than any period of Indian history. Political and ideological considerations in modern times have contributed to a lively controversy on the nature of the state in Mughal India and on the policies of individual rulers such as Akbar and Awrangzeb”. Two examples cited in the work are worth mentioning here in order to bring this idea closer to home. Emperor Nur al-Din Jahanghir (who reigned during 1605-1627) has been considered a zealot and fundamentalist (despite the glaring irony of his drinking habits) owing to the executions of Arjun (d. 1606), the fifth guru of the Sikh community and of Nur-Allah Shushtari (d.1610), a revered Shii theologian. ‘Islamic bigotry’ and ‘Sunni fanaticism’ can be cited as motives behind the executions. But there are other factors which show better (worse) motives behind the actions of Jahanghir. The question Sajida Alvi asks is why he did not harass or persecute Guru Arjun Dev’s followers or why Aurangzeb did not persecute the followers of Guru Tegh Bahadur, whom the latter killed. She cites Jahanghir’s frequent encounters with Gosain Jadrup, a Hindu hermit, whose suggestions forced the emperor to order a change in the weight measure. There is the question of fitna or rebellion which would better explain the motives behind the executions. No ruler has ever tolerated fitna. Sajida Alvi says: “After all, the function of sovereignty is to prevent anarchy and lawlessness.” Jahanghir’s oppressive policies not only against non-Muslims as cited above but against Muslim scholars and intellectuals Shaykh Ahmad Sirhindi (whom he imprisoned and characterized as shaiyad-impostor) and Shaykh Nizam al-Din Thanesari (whom he banished to Makkah) revolved around their rebellion against his policies and their support for his brother Khusraw, who was a fellow aspirant of the title. Another important argument Sajida Alvi makes is against the alleged abhorrence of Emperor Awrangzeb of music, which she countered by citing the statement of Muhammad Bakhtawar Khan, the author of Mirat al Alim, a rare work which, like the well-known Alamgir Nama and Ma’athir Alamgiri, is a primary biographical source on the life of Awrangzeb. Bakhtawar Khan says, in 1660, “during the celebrations to mark the completion of two years and the beginning of the third year (of Awrangzeb’s first coronation), the emperor honoured Khushhal Khan, a musician, unique and unequalled in his vocation, at the auspicious imperial court.” Also, Sajida Alwi writes: “There were musicians in Awrangzeb’s war camp in Deccan and the patronage of musicians continued in Delhi during his long absence from Delhi. I should add that interest in music and musical theory is manifested in the production of an important work, shams al-aswat, sun of sounds, written in 1697 by Ras Baras, son of Khushhal Kalavant, thirty seven years after the first coronation of Awrangzeb.” “Ras Baras’ work, Sajida Alvi adds, is “the translation of one of the most significant musical treatises of Indian music, i.e sangitaratnakara, by Sarangdeva, a Brahman of Kashmiri descent. 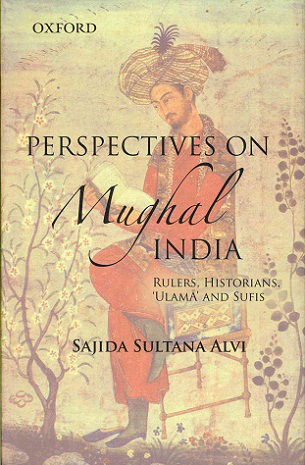 Perspectives on Mughal India: Rulers, Historians, Ulama and Sufis, because it does not have the motive of historical diagnosis (searching the reason for present political conditions in the past), comes about a rare book on several new insights about Mughal history. Sajida Alvi achieves this by searching for and exploring rarely used primary sources like Mirat al Alim, Tarikh-i-husayniyyah (a source for history of Awadh), mazhar-I Shajahani (a work in the genre of ‘mirrors for princes’ on political ethics), Maktubat, Hadrat al qads, zubadat al-Maqamat (works which throws light on the Naqshabandi Sufi order, on the lives of Sha Waliullah, Shaykh Ahmad Sirhindi, Mazhar Jani Janan, writings of Qadi Thana Allah Panipati etc. It requires a lot of effort to deconstruct the notions of colonial historiography and the modern as well as post-modern assumptions it spawned. It is that effort that makes Sajida Alwi’s work a must-read on Mughal history. Carl Ernst’s foreword and Syed Nomanul Haqq’s introduction simply attest to that relevance.